Posted by	 27/05/2009 25 Comments on Welcome! Welcome to my new blog and to my blogiversary celebration! The past year of blogging was much fun. Thanks to all you kind people out there who contributed with comments and supported me with hints and tips. 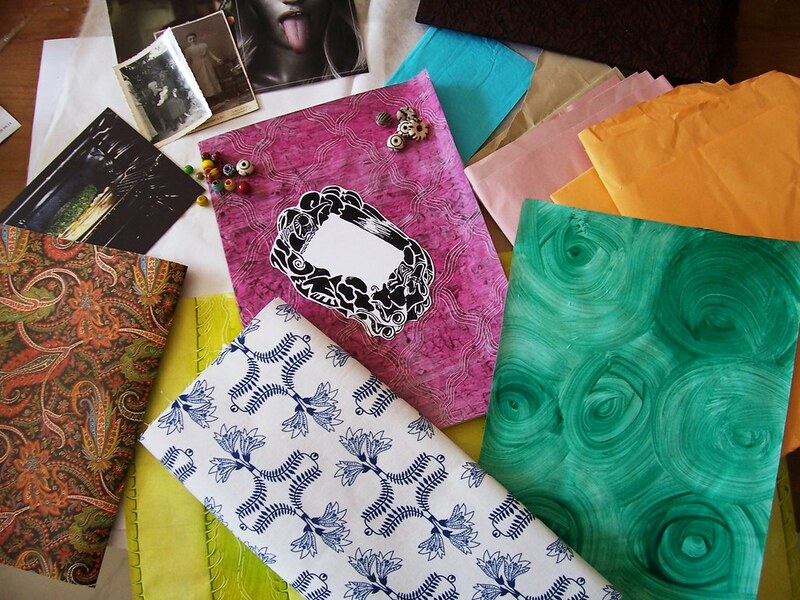 Three different sheets of my paste paper, a big sheet of a gift wrapping paper with a paisley pattern, a piece of backed cloth, some scraps of other paper, some old photographs I once purchased on a flee market, some post cards with interesting pictures, some beads, some labels that I printed. Furthermore, I added two beautiful sheets of cream white Siam mulberry paper (to give you an impression of how nice this paper it: I used it for the knot book here.). And there are several sheets of the construction paper that I used for my Maxi Book. Just leave a comment, let me know what you think and whether and in which give-away you want to participate (you may of course enter in both!) and your name will be included in the pull next Wednesday. I’ll publicly announce the lucky winners on this blog. I’ll then exchange emails with the winners and ask them for shipping details. I’ll happily sent both items to anywhere in the world. Love the website! I actually like the first banner best – most cohesive and easier to read than no.3. I’d love to enter your giveaways. The stuff looks fab. So do your books, by the way. 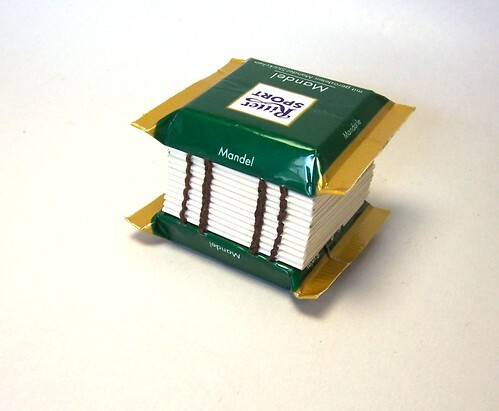 I’d never have thought to use RitterSport wrappers to make a book! Fabulous! Congratulations on your new website! I’ve been clicking around this morning, and I think it works very well. You have included all of the right information on all of the right pages :). I really like the serif typeface of the second banner option. I like the sketchy lines that run through verzwirnt und zugeleimt. It would be neat to see the paw print in that same sketchy style. I’d love to enter your Ritter Sport book give-away! I really enjoyed your posts about them. Again, congrats! I’ve added the new blog to my Google Reader. By the way, I got my smiley oracle! 😀 It’s so beautiful, and fun to play with – my daughter asked questions all evening, and refused to go brush her teeth, haha! It’s good to hear that it works on a Mac since I have no opportunity to test that here. And it’s so nice to hear that the smiley oracle was a success in your family 🙂 It’s good that it is being used! I like this new website!! Ich finde die Seite sehr übersichtlich und gut gelungen. Man kann sich alle Bücher auf den guten Fotos genau anschauen und die Beschreibungen sind sehr ausführlich. Ich finde es auch toll, dass einige Beschreibungen auf Deutsch sind!Deine Bücher sehen echt super schön aus!Ich wünsche dir viel Erfolg mit der neuen Seite! Ich habe mich noch nicht zu den Bannern geäußert. Mir gefällt das aktuelle, also Banner 1 am besten! The new blog looks great! Very professional and sleek. The website is nice, too. For the record, I use a Flock browser and everything comes across just fine. I don’t see anything that looks like it’s misrepresented. Easy to read, too. I think the banner you have up is nice. 2 looks like it might be a bit harder to read and 3 is maybe a little crowded, so this one is kind of a nice medium. I prefer header #2… this is my first visit, but it looks wonderful and I will enjoy poking around! I suppose I should also add — I love your explanation of your names. I love that aspect of German. So many semi-words — I’m pretty fluent in reading/hearing (my writing/speaking is always rusty), but I’m always having to figure out some of your words that are new to me 🙂 And German has so many entertaining little words like schnuppelig. It’s good to hear that someone likes the little remainders of my once German blog 🙂 I was wondering whether it might scare people off. I do however like the banners a lot, I prefer banner 1, 2 would be optional 3 is too crowded and messy. Thanks Liesan for an honest answer! I’m not sure that I understand you correctly: Are you saying you would prefer 2 instead of 3 columns? Maybe I’ll try deleting the left column and will put the content the right panel next week. Then we’ll see whether it then gets better. Well yes I would prefer 2 columns & I would prefer the menu to be on the right side & I don’t really like grey blocks before each menu item. You stumbled in here, while I am still editing the style files. Sorry if everything looks more or less scrambled. Probably I’ll keep the cat in the sidebar – it is my avatar as buechertiger on various other sites. You would miss the German? That’s nice to hear, too, actually. I don’t think I will keep the German out of it completely. But I won’t write everything in two languages anymore. I think it looked ugly and – more important – needed at least twice the time to be finished. I really like that you are a self taught bookmaker – it is encouraging to find someone with your skill set who is sharing your ideas and “finds”. I have long had you on my Google Reader and I have just changed it to your new address. 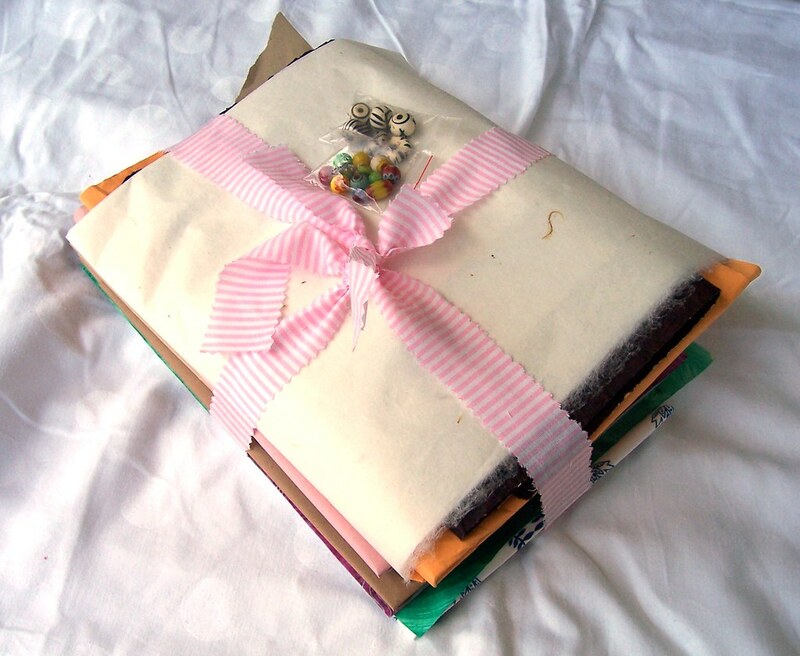 I would love to be in your drawing for the fabulous materials you have offered – or your book would make a fun addition to my “Handmade” only shelf! Everything looks good on Mozilla browser, website and blog. Love your work. Leave some German in! It makes you stand out. I prefer the top banner as it’s easier to read.